“Chamber music is a form of classical music that is composed for a small group of instruments—traditionally a group that could fit in a palace chamber or a large room. Most broadly, it includes any art music that is performed by a small number of performers, with one performer to a part (in contrast to orchestral music, in which each string part is played by a number of performers). However, by convention, it usually does not include solo instrument performances. I have never been to either. My friends Geeta and Koushik. as part of our current Vijayadashami festival, treated their friends and some members of their family to an evening of Carnatic Music and excellent food afterwards last Friday. It was a typically Indian adaptation of the Salon and Chamber Music combination called a Baithak. The performers were sitting on the floor and playing and some of the audience too did the same, though the older like me, preferred to sit on chairs. It was two hours plus of sheer mesmerising Carnatic Music at its best. The singer Smt. Sushruti Santhanam, an accomplished artiste sound in theory as well as in rendition, introduced each piece to the audience, most of them unlike me, not comfortable with Tamil or Telugu, with English translation of the verses being sung as well as the background to each. 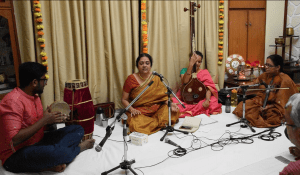 Carnatic music is entirely devotional and often transports the performer as well as listeners to meditative states and this is exactly what Sushruti achieved with consummate ease. On two occasions I was moved to tears with her bhakti, something that has not happened to me in a long long time. Her troupe, all amateurs, Smt. Aruna Sivaram on the violin, Sri. M.B.Harsha on the Mridangam and Smt. Sowmya Jayabharadwaj, with the Tanpura accompanying in singing, were equally brilliant and I was very impressed by the thani-avarthanam of the mridangam and the solo renderings of the violinist. The icing on the cake was the post music session dinner of delicious South Indian cuisine. One particular item, a pickle took me back to many decades and I requested my hostess to let me have some to have at home which she gladly did. All in all a delightful and unforgettable evening. This entry was posted in Food, Friendship, India, Music and tagged Bhakti, Carnatic music, Chamber Music, Salon, Tanpura, Thani Avarthanam, Vijaya Dashami. Bookmark the permalink. 5 Responses to An Unforgettable Evening. It sounds utterly delightful Ramana, I would have so enjoyed it. I hosted some salons on my time. I love enjoying people connecting and stimulating each other in conversation. And yes, I do love Chamber Music too. It can set a wonderful mood of relaxation and also elation. I have no doubts whatsoever that you would enjoy an evening of live Carnatic Music. Most people who like Western Classical Music do when they hear Indian Classical Music. Sushruti Santhanam is simply a rock star! Thank you! I am hoping to host an evening like that at my place for a smaller group this winter. Tentatively, the same troupe but for a longer session and a different cuisine for post session dinner. I also intend making it sans electronic sound system to assist the group so that the natural effect can be had. Let us see.